Welcome To Wombles Of War! 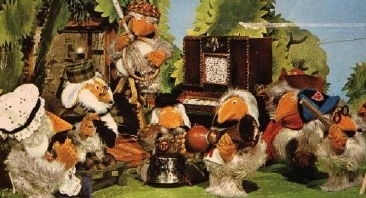 This picture is the front cover of the Wombles first album, Wombling Songs. Hello. Erm, what can I say, the Wombles of War split after I left back in November. This was because I didn't really have the time because of my mocks, and I wanted to be part of a clan, not it. I am still Firefuel and I still play TF on Wireplay. I hadn't updated this in a while, so I am roughly filling what happened. Since then, I joined AnoD, but it didn't work out, so I have joined DF which is going well. Great news! The Wombles are back on Wireplay! Many of us missed the friendship and the clan thing in WoW. We did have a good time, so I thought for a bit, which is quite lucky :) All of us went our seperate directions into new clans, ao I wasn't going to start up WoW again. But, I have taken the ideals behind it to make our group. It is still early times, but currently we have a mailing list to say when we will meet or go on. We all have Womble names and our tag is W for Wombles! W is like a loose clan, but we are all close friends so we expect some comitment to each other. You are welcome to ask if you can join us, but we will want to know you for a while before you are granted your name. This page is designed for 800*600 resolution and is best viewed in Internet Explorer 4.